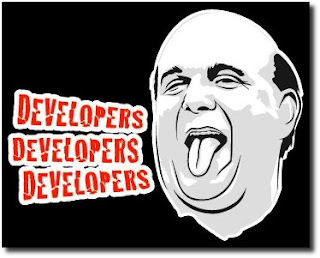 Yesterday, my post was about the latest stupid remarks by Steve Ballmer at the Gartner Symposium ITxpo. Today, we'll take a look at his all time most ridiculous quotes. Sorry if this has become a two-day 'Steve Ballmer's Stupid Words Special'. Anyway, we are just having some fun here so just sit back, relax, and enjoy my top 12 most absurd quotes by Steve Ballmer. 12. "Google's not a real company. It's a house of cards." 11. "DRM is the future." 10. "Our mail product, Hotmail, is the market leader globally." 9. "I don't know what a monopoly is until somebody tells me." 8. "We've had DRM in Windows for years. The most common format of music on an iPod is "stolen"." 7. "We don't have a monopoly. We have market share. There's a difference." 6. "My children - in many dimensions they're as poorly behaved as many other children, but at least on this dimension I've got my kids brainwashed: You don't use Google, and you don't use an iPod." 5. "There's no chance that the iPhone is going to get any significant market share. No chance." 4. "Linux is a cancer that attaches itself in an intellectual property sense to everything it touches." 3. "I'm going to f---ing bury that guy, I have done it before, and I will do it again. I'm going to f---ing kill Google." 2. "I have never, honestly, thrown a chair in my life." 1. "Developers, developers, developers, developers, developers, developers, developers, developers, developers, developers, developers, developers, developers, developers..."
You may also want to see this list of inspiring Steve Jobs quotes for FOSS developers to ponder. lets scrap this oblsolete system, join the revolution. "Advertisers, advertisers, advertisers" makes the famous developers quote look smart. "The most common format of music on an iPod is "stolen"." To be honest, that's not absurd. Do you really think kids that have an 8gb iPod filled with thousands of songs got all those songs legally?